Vermont is known as the Green Mountain State because the state’s name comes from the French words “vert “ and “mont,” meaning “green mountain”. This is one explanation for the origin of Green Mountain, but others say that it’s simply because the mountains in Vermont are greener and covered in forests compared to the higher White Mountains in New Hampshire. The capital city is Montpelier, which it populated by 8247 residents making it the smallest population of any state capital. Montpelier is also the only state capital without a McDonalds. 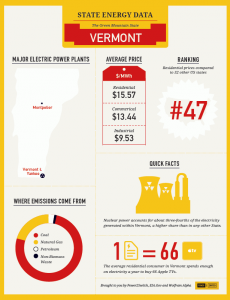 Vermont is the next stop on our United States of Energy Data series Ranking number 47 in residential electricity prices compared to 52 other US states averaging $15.57 Megawatts per hour. 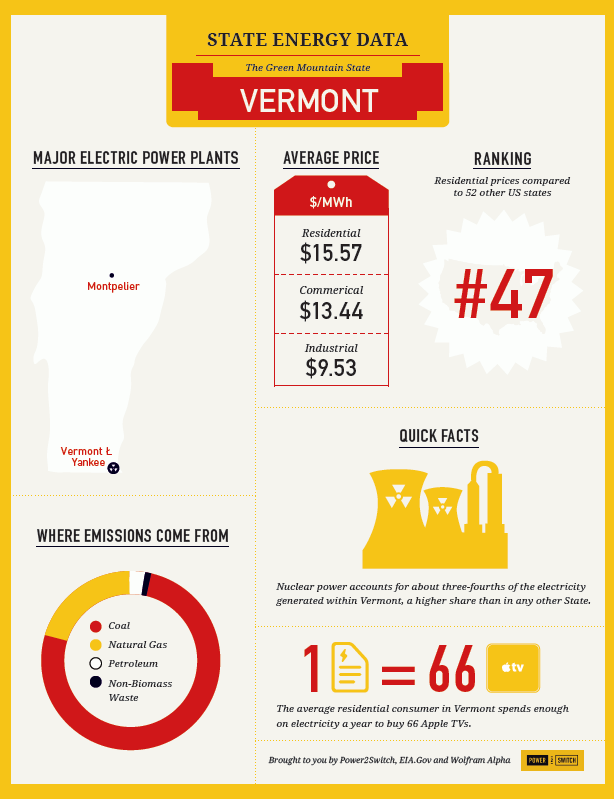 Nuclear power accounts for about three-fourths of the electricity generated within Vermont, a higher share than in any other State. Did you know? Vermont is famous for maple syrup, dairy and lakes. Vermont is the largest producer of maple syrup in the U.S., producing over 500,000 gallons a year. Forty years are required to grow a sugar maple tree large enough to tap. A tree ten inches in diameter is considered minimum size for one tap. It takes 4-5 taps to produce enough maple sap (40 gallons) to produce one gallon of syrup.